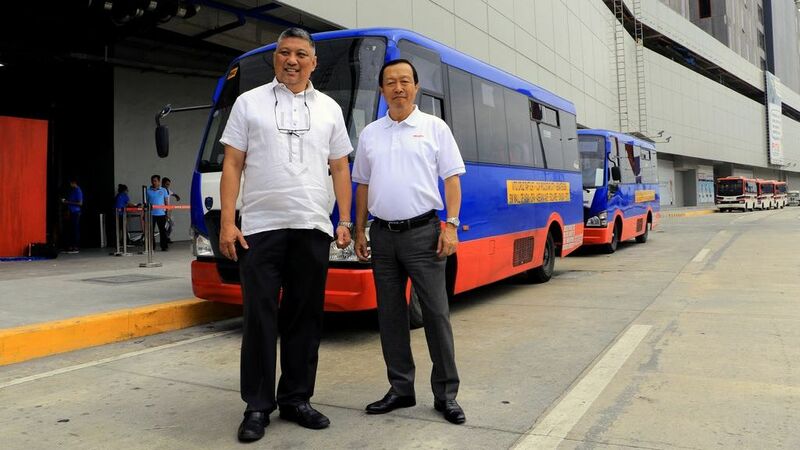 Executives of Isuzu Philippines Corporation (IPC) paid a visit last March 26 to the Paranaque Integrated Terminal Exchange (PITX) in Parañaque City to witness how Isuzu’s modernized public utility vehicles (PUVs) are helping enhance PITX’s services and operations. Touring the PITX facilities were IPC President Hajime Koso, Sales and Marketing Division Head Joseph Bautista, and Corporate Communication Manager Nora Liquido. They were met by PITX General Manager Mariano Antonio Arroyo. The IPC officers were transported to PITX on board an Isuzu QKR77 cab and chassis platform configured into a Class 2, 23-seater, air-conditioned, modernized PUV with the rear body designed and manufactured by Almazora Motors Corp. This PUV is one of the 15 units franchised to the Senate Employees Transport Service Cooperative (SETSCO) plying the southwest Manila route from the Cultural Center of the Philippines (CCP) to PITX and vice versa. The SETSCO franchise also signifies IPC’s pilot endeavor with the modernized PUV. These PUVs started operations June 18 last year. On board the modernized PUV, the IPC officers enjoyed its amenities, comfort, and safety. The PUV body is compliant with Philippine National Standards (PNS 2126:2017). The passenger cabin floor-to-ceiling height and gangway provide more space for passengers to move easily inside. The passenger door is safely situated on the right-hand side, facing the sidewalk. Other design features of the body include panoramic windows and windshields, full-body insulation with GeneQ shield, automatic door closer, ECE-compliant headlamps, brake system, wipers, windshield washer, side view mirrors, and provisions for persons with disabilities. Completing the modernized look and features of the new PUVs are the LCD/LED TV monitors, electronic signages, fire extinguishers, GPS navigation system, CCTV, dashcam and back-up cameras, and the automatic fare collection system—all geared for passengers’ safety, entertainment, and added convenience in fare collection. As the group disembarked at the designated unloading area and entered the PITX facilities, they witnessed the spacious, airport-like facilities—all geared for the convenient, comfortable, safe, and speedy transit of passengers coming in and out of southwest of Metro Manila. The arrivals and departures of provincial buses are well-segregated and orderly (buses arriving from the provinces are directed to the 2nd level, while departures are at ground level), with numerous LED monitors on the hallways indicating bus schedules, destinations, arrival and departure times, and strategically placed speakers announcing transit updates. Ticketing booths are numerous and conducted expediently. Passenger waiting areas are similar to those of airline lounges. The multi-level PITX is air-conditioned all throughout, with various food stalls and merchandise stores lining the walkways for passengers’ shopping needs while in transit. The PITX also offers loading and unloading bays for metro jeepneys and garage-to-terminal (GT or UV) shuttle vans. The PITX, built and operated by Megawide Construction Corp and the Department of Transportation, started operations on November 5, 2018 under the Public-Private Partnership program, has been projected to be able to handle up to 200,000 passengers daily, servicing the following routes in the Cavite and Batangas provinces: Kawit, Noveleta, Cavite City, Tanza, Naic, Maragondon, Ternate, General Trias, Trece Martires, Indang, Bacoor, Imus, Dasmarinas, Silang, Amadeo, Tagaytay, Mendez, Alfonso, Nasugbu, and Lian. PITX GM Mariano Antonio Arroyo acknowledged the significant role the modern PUVs play in the fulfillment of PITX’s mandate. He affirmed that modern PUVs such as those of Isuzu have helped immensely in expanding the branding, purpose, and public acceptance of the PITX. He described that even before commuters enter PITX, they have had a taste of modern commuting inside the Isuzu modern PUVs.